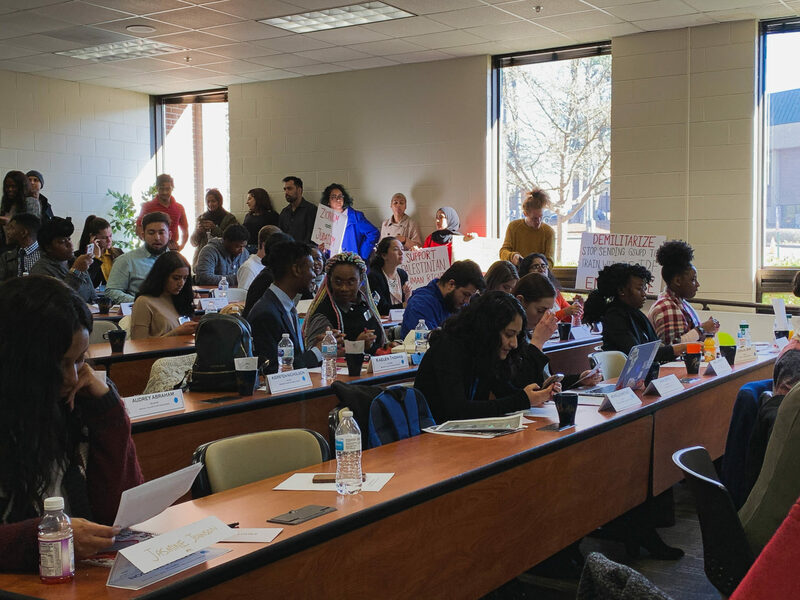 The second half of Student Government Association’s 89th term has begun, surrounded in conflict as protesters confronted the leaders face-to-face at the first university-wide senate meeting last Friday. The protesters, some representing chartered organizations like Faces for Feminism and Panthers for Black Feminism, brought a list of demands based on their concerns regarding the attendance of four SGA members on a free trip to Israel over winter break. An apology from SGA for attending the trip. The resignations demanded included President Franklin Patterson, Atlanta Executive Vice President Ayesha Iqbal and Communications Director Kalisha-Lourdy Lazare. On Wednesday evening, the Office of the SGA President issued a press release, which can be viewed in full below, responding to these demands. In response to the first demand, the release pointed to Georgia Senate Bill 327 as a reason behind why SGA cannot pass anti-Israel legislation. The bill, which went into effect in July of 2016, has been referred to as the “anti-BDS bill,” and prevents the state from entering into contracts with companies that boycott — or plan to boycott — the state of Israel. The BDS movement seeks to promote boycotts, divestments and sanctions on the state of Israel. With this bill in place, SGA doesn’t have in any ability to pass pro-BDS legislation, as Georgia State is a state-funded school, according to Patterson. “The decision in regard to actionable BDS legislation either supporting or disagreeing will be determined by to the Board of Regents and our state legislators,” the release stated. The press release firmly rejected the protesters’ demand for resignations. “Neither I, EVP Iqbal, or Communications Director Lazare will be stepping down from our SGA positions,” Patterson said in the release. If the entire executive board were to resign, as the protesters had hoped for, the replacement of these individuals would have become rather complicated. Under the circumstance that the president can no longer serve, according to the SGA Election Code, one executive vice president would be appointed through a university-wide senate meeting to the position. Given that the protesters requested all EVPs resign as well, this process wouldn’t have been possible. To fill the vacancy of an EVP, the speaker of the senate would have to assume the responsibilities of that EVP’s remaining term, yet there are six EVPs and only one speaker. Patterson also withheld any apology for attending the trip. The only mention of an apology was one given previously by Sen. Hamza Rahman regarding his choice of language during a heated conflict after the Friday senate meeting. “Instead of seeing this trip as a means to offend, it was used to gain insight into different mindsets, which would have been normally overlooked,” Patterson said. Aside from addressing the demands, Patterson also used the release to reflect on the weight upon student leaders, their duty in upholding high standards and the importance of representing the views of the student body. Moving forward, Patterson said this conflict has propelled the administration toward completing the Inclusivity Initiative that began the previous semester. Patterson outlined the importance of inclusion alongside diversity. “How are you supposed to learn different perspectives and see things from a different point of view if you don’t interact with people that do not look like you or believe the same things you do?” Patterson said. He said the issues brought forward by the protesters have shown him the importance of seeing all views and making every student voice heard. “You don’t have to listen to be understood but you do have to listen to understand the other side,” Patterson said.